It’s astounding how the same tired message gets repeated decade after decade, yet is always wrong. It raises a serious question. How can large groups of people succumb to a message that is demonstrably wrong? While that question can’t be answered quickly, the examples of these failed messages can be cataloged. The original message was probably from Malthus, who claimed the world was headed toward disaster. His simplistic message was that population grew exponentially, while food production grew arithmetically. In his view, the starvation of millions was inevitable. Marx was the next best known proponent of a society headed toward disaster, but his solution was socialism. By putting the output of society in the hands of workers, the workers would prevent negative outcomes because they shared in the outcome. Unfortunately, millions of people died at the hands of their leaders before the extreme variant of socialism, known as communism, began to collapse. Jump ahead to the mid to late 1900s, after the two great wars, and two proponents of Malthusian thinking emerged again. The first, chronologically, was the publication of The Population Bomb, by Dr. Paul R. Ehrlich, in 1968. This forecast of mass death was wrong. In 1972, the Club of Rome published The Limits to Growth. The Limits to Growth proposed that the world could not sustain growth because the world was running out of resources, especially oil. The common denominator of all these forecasts was that the world lacked the resources to sustain growth. This has now morphed into the issue of sustainability. The United Nations World Commission on Environment and Development issued a report in 1987, known as the Brundtland Report, which was to unite people in sustainable development. 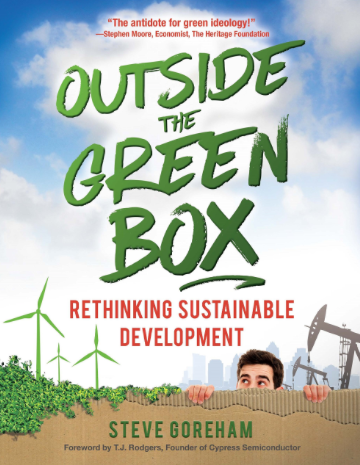 The precepts of Malthus, Erhlich and the Club of Rome were enshrined by the Brundtland Report, putting the world on notice that the world could not continue to grow unless it accepted the need to adopt sustainable development. Splinter groups have sprung up to proselytize the need for sustainable development. Sustainability assumes the world is running out of resources. But sustainability has a fundamental flaw: It ignores the human mind, the greatest resource of all. Erhlich’s forecast of starvation was upended by the Green Revolution, led by Norman Borlaug, with the development of high-yielding grains. Peak Oil, as espoused in the Limits to Growth, has been upended by the fracking revolution. At every turn, whenever mankind confronts an obstacle, it develops alternatives that overcomes the obstacle. Supposedly, we are running out of Lithium for batteries. But there has been a proposal to extract Lithium from wastewater produced by drilling operations. Only time will tell whether the process works, but the human mind is already working on how to solve the problem of Lithium shortages. There is another common denominator to the ideas promoted by Malthus, Ehrlich, the Club of Rome and the United Nations Brundtland Report. Sustainably requires leadership by the educated elites who will tell the ordinary person how to live. For example, there was the UK proposal, as reported by the Daily Mail, where each person would be issued a plastic card with a fixed carbon allowance. Each time the person ate at a restaurant, bought gasoline or flew by plane, the carbon used would be deducted from the card. When the person’s allowance was used up, that person wouldn’t be able to do any activity that produced CO2. There was the Waxman-Markey bill that would have required homeowners to insulate their homes to a prescribed level, with attainment recorded on their deed, and with a home efficiency rating label displayed on the building. Sustainability is another false god that will leave billions in poverty while dismantling modern society. Economic growth is necessary to maintain our standard of living, and to allow billions to evolve from poverty around the world. We only need to look at history, i.e., Malthus, Ehrlich, and the Club of Rome’s, Limits to Growth, to see that the human mind is the ultimate resource, and that there are few, if any, real limits to growth. Great work Donn. Did you pass this to SEPP? “But sustainability has a fundamental flaw: It ignores the human mind, the greatest resource of all.” — not really, in fact the human mind is what came up with sustainability in the first place. We are building the foundation for the future, and just as the world’s first computers were huge, used a lot of power, and took up a whole room but now something far more powerful fits in the palm of your hand, the same is true for renewable forms of energy. Some are less efficient now, but we have to invest in them if we want them to reach their full potential. This is common sense, and the reason that they are so popular now is because the greatest human minds are working on improving these technologies. Failure to see that ignores history, ignores modern technological trends, and is extremely short-sighted. If everyone thought like that, we would still be living in caves. How many examples of the dwindling of resources or the fallout from the loss of biodiversity have you ignored? How many examples of human ingenuity that turned out to be folly? This essay is irresponsible at best. Weekly Climate and Energy News Roundup #267 | Watts Up With That?